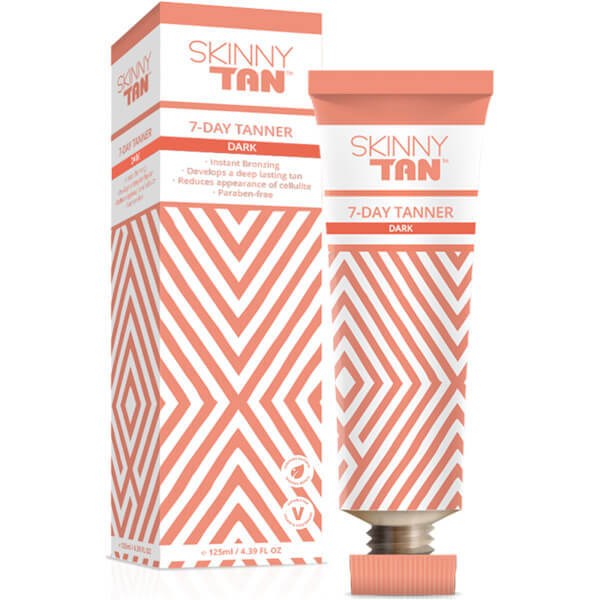 Reveal natural-looking, bronzed skin with the SKINNY TAN 7 Day Tanner in Dark; an effective tanning cream that delivers long-lasting results. Effortlessly gliding onto clean, exfoliated skin, the false tan offers a deep golden glow that develops into an enviable, sun-kissed tan lasting up to seven days. Free from parabens and cruelty. Suitable for vegans. Exfoliate your skin in the shower with the Skinny Tan exfoliating mitt and pre-tan primer to help create a smooth surface to apply your tanner. Lightly moisturise dry areas hands, feet, knees, elbows and ankles. 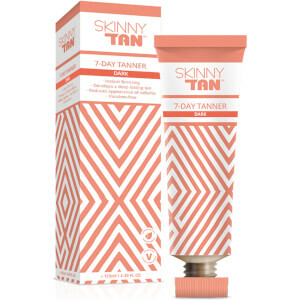 Apply with the skinny tan roller or the Skinny Tan luxury tanning mitt. Start by adding a small blob of tanner either directly onto the skin and working into the roller or mitt as you go, or by applying directly to the roller or mitt before applying to your skin. Makes sure all the skin you want to tan has now been bronzed. For hands and feet, take the Skinny Tan mitt and pat with an almost solution free Mitt to give a natural softness to the resulting tan in these areas. Leave to develop for 6 hours or overnight. Shower as usual to rinse off the guide bronzer revealing your flawless, streak-free tan. TIP! Use less tanner than you would ordinary chemical tanners. On average there are 4- 6 full body applications. Purified Water (Aqua), Prunus Amygdalus Dulcis (Sweet Almond) Oil, Dihydroxyacetone, Helianthus Annuus (Sunflower) Seed Oil, Caramel (CO 150d), Cetearyl Alcohol, Sorbitan Stearate, Peg-40 Stearate, Glycerin, Paullinia Cupana (Guarana) Seed Extract, Benzyl Alcohol, Dehydroacetic Acid, Citric Acid, Sodium Citrate, Hydroxyethyl-cellulose, Parfum, Coumarin.